Delivery timescale for this outfit is 5-6 weeks from the receipt of the payment and provision of final measurements. Please contact customer service if you want rush delivery. With a deep, majestic dazzle, this beautiful jewelry set designed with citrine and purple gems and zircon studed work that really fascinates. 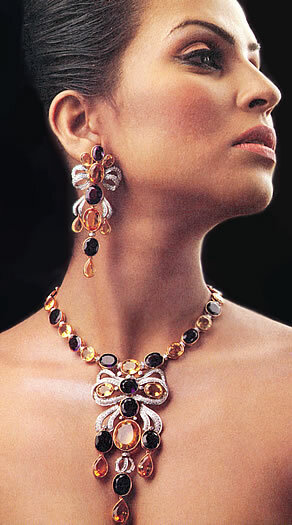 This set is composed of necklace and pair of earrings. Click the button below to add the BJ225 Dark Purple Jewellery to your wish list.